Lapras (ラプラス, Rapurasu, /ˈlæprɪs/) is a Pokémon species in Nintendo and Game Freak's Pokémon franchise. Created by Ken Sugimori, Lapras first appeared in the video games Pokémon Red and Blue and subsequent sequels, later appearing in various merchandise, spinoff titles and animated and printed adaptations of the franchise. It is voiced by Rikako Aikawa in both the Japanese and English-language versions of the anime. Lapras was one of 151 different designs conceived by Game Freak's character development team and finalized by Ken Sugimori for the first generation of Pocket Monsters games Red and Green, which were localized outside Japan as Pokémon Red and Blue. It was supposed to be called Ness in the English versions after the mythical lake creature Loch Ness Monster, but was eventually changed to Lapras. [better source needed] Lapras might have got its name from famous French scholar Pierre-Simon Laplace, who studied the theory of tides among many other accomplishments. In this line, the actual etymology could also be la place (French for the seat, referring to its ability to ferry people). Lapras, known as the Transport Pokémon, is a large sea creature which resembles a plesiosaur. It may also be inspired by placodonts. It has four flippers, however its front ones are notably larger than its hind flippers. It has a long neck, and large black eyes. Lapras has unusual curled ears and a short horn in the middle of its forehead. The majority of its body is blue, while its underside is a light cream-yellow color. Its most distinguishing feature is the gray shell on its back, which is largely dotted with blunt knobs. Lapras is most known for its fondness of moving people and Pokémon across bodies of water. Some Lapras are able to develop Psychic abilities such as telepathy, which makes them able to understand human speech. They keep track of their fellow pod members through use of high-pitched songs they constantly sing, much like whales. Unfortunately due to their docile nature they do not like to fight, and this has made them an easy target for hunters, which has made them very rare in the wild, due to being over hunted. Despite this, wild Lapras are somewhat common in the Sinnoh region, appearing in Victory Road exclusively but at a fairly abundant rate. 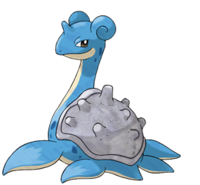 Lapras first appears in Pokémon Red and Blue, Yellow and appears in the subsequent remakes Pokémon Yellow, FireRed, and LeafGreen. In it, players are given a Lapras in Saffron City. Lapras appears in every main Pokémon title following, most notably in Pokémon Gold and Silver as well as its remakes Crystal, Pokémon HeartGold, and SoulSilver, where it can be found in a certain area every Friday until captured. In Pokémon Diamond and Pearl wild Lapras are a more common sight, but they still only appear in a single area. Lapras appears in other Pokémon titles, including Pokémon Conquest, Pokémon Snap, Pokémon Channel, Pokémon Pinball, Pokémon Trozei!, the Pokémon Mystery Dungeon titles, the Pokémon Ranger titles, Pokémon Rumble, and PokéPark Wii: Pikachu's Adventure. It also appears in the crossover game Super Smash Bros. Ultimate, under the form of a spirit which can be ridden to cross water bodies within the "World of Light". In the anime, Ash travels to the Orange Islands and finds a small Lapras which has been accidentally left behind by its pod. It joins him after he rescues it from some unscrupulous trainers and Team Rocket. It is mainly used for transportation between the various islands, but he uses it in some battles. Lapras eventually reunites with its pod and leaves Ash. They meet up again in Johto where Lapras rescues its entire pod from Team Rocket and becomes their leader. Lapras also appears in the second part of the anime special Pokémon Mystery Dungeon: Explorers of Time & Darkness where she takes Piplup and Chimchar on a ride. In the Pokémon Adventures manga, Pryce lost two of his favorite Lapras in an avalanche, just as the egg born by them hatched. Unable to get over his loss, Pryce swore to save his Lapras and thus began researching into time travel, setting the events of the Johto saga in motion in which he tries to capture a Celebi in a GS Ball. IGN's Pokémon Chick wrote that Lapras was "amazing" and has "won the heart of many a trainer, including yours truly" due to its "great beauty, grace and gentleness." UGO Networks' Chris Plante named Lapras one of the "most unconventional vehicles in games". GamesRadar's Raymond Padilla wrote that it is "one of our favorite Pokémon from the original game." Author Loredana Lipperini wrote that Lapras was "reliable", "placid", and "gentle". Lapras has been compared to several creatures both real and mythological. IGN wrote that it was "loosely based on a plesiosaur, crossed with a tortoise". Gamershell's David Jenkins compared Lapras to the Loch Ness Monster. Author Ash Dekirk described it as a combination of a sea turtle and a dragon. He also described it as resembling a plesiosaur with a spiky tortoise shell on its back. Official Nintendo Magazine's Thomas East compared it to a plesiosaur as well as Loosha from Professor Layton and the Last Specter. Game Revolution's Johnny Liu described it as a "subservient Loch Ness monster". IGN named it the 27th best Pokémon. Game Informer also included it in its list of Pokémon at #29. Official Nintendo Magazine's readers voted it the eighth best Water-type Pokémon. ^ Stuart Bishop (2003-05-30). "Game Freak on Pokémon!". CVG. Archived from the original on 2008-02-08. Retrieved 2008-02-07. ^ Game Freak (2001-07-29). Pokémon Crystal. Game Boy Color. Nintendo. This gentle Pokémon loves to give people rides and provides a very comfortable way to get around. ^ Game Freak (1999-10-19). Pokémon Yellow. Game Boy. Nintendo. A gentle soul that can read the minds of people. It can ferry people across the sea on its back. ^ Game Freak (2004-09-07). Pokémon FireRed. Game Boy Advance. Nintendo. Its high intelligence enables it to understand human speech. It likes to ferry people on its back. ^ Game Freak (2003-03-17). Pokémon Ruby. Game Boy Advance. Nintendo. People have driven Lapras almost to the point of extinction. In the evenings, this Pokémon is said to sing plaintively as it seeks what few others of its kind still remain. ^ Game Freak (2000-10-15). Pokémon Gold. Game Boy Color. Nintendo. They have gentle hearts. Because they rarely fight, many have been caught. Their number has dwindled. ^ Game Freak (1998-09-30). Pokémon Red. Game Boy. Nintendo. A Pokémon that has been overhunted almost to extinction. It can ferry people across the water. ^ a b East, Thomas (2012-02-10). "Best Water Pokemon". Official Nintendo Magazine. Retrieved 2014-03-02. ^ Drake, Audrey. "Lapras - #27 Top Pokemon". IGN. Retrieved 2014-03-02. ^ Harmon, O'Dell (2012-11-21). "Top 50 Pokémon Of All Time". Game Informer. Retrieved 2014-03-02.